File Comparison for Excel (Excel Compare) eliminates the manual search for differences in Excel files and offers a computer aided comparison of Excel files. 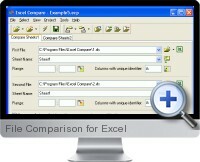 File Comparison for Excel allows to compare Excel files, Excel spreadsheets and selected ranges of sheets. The tool compares data straight from worksheets, and presents the results on a new Excel sheet as a publication quality report (Difference Report), that is ready to print or save. The report displays the added, deleted and changed data. This tool can be used for the analysis and auditing of the changes made. Allows for comparing of sheets, that contain a database structure. The advanced comparison algorithm for the data not containing unique identifiers. Allows for comparing of any selected ranges of a sheet. Allows for comparing all files located in two different directories. Allows for the comparison of all sheets with the same names in two workbooks. Creates Difference Report as a new Excel sheet. Difference Report keeps the format of the compared data. Highlighting the cells that have changed. Allows for dividing of the report into three parts: deleted, added and changed data. Allows the automatic addition of user-defined macros to the report workbook.